Rutherford Platt, in The Great American Forest (1965) tells us that our deciduous forests evolved nearly 50 million years ago and continued to evolve through successive climate change eras. The last ice age modernized our forest, as new species were added to existing families. In our region, after the last glacier receded, tundra gave way to a patchwork of tundra, bog, and spruce swamps, thence to jack pine forests, which migrated northward as a mixed forest of pines and hardwoods moved in. 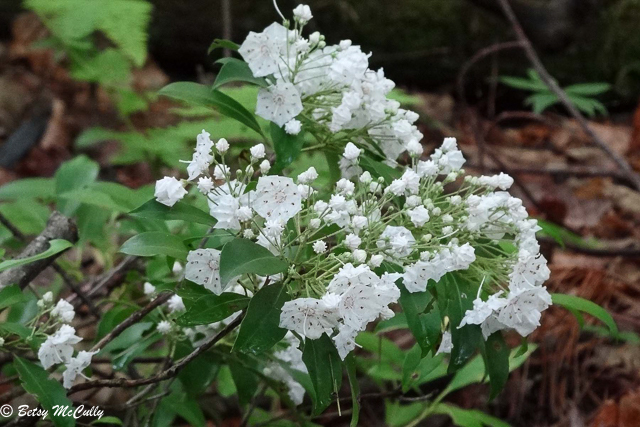 A hallmark of modern hardwood forests is an understory of flowering trees and shrubs, including sassafras, viburnum, amelanchier, magnolia, laurel. All these species were present here in the Late Cretaceous some 65 million years ago, as we know from fossils found in Cretaceous rocks on Long Island and in New Jersey. Hollies are the most ancient of our species, originating nearly 90 million years ago, disappearing at one point, then reappearing in our post-glacial era. 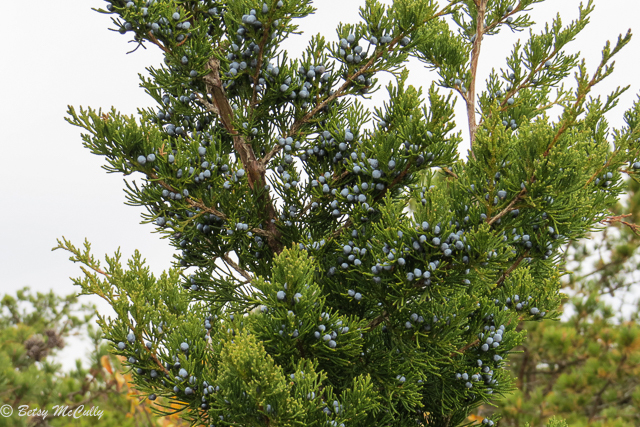 Juniperus virginiana (Red Cedar) with seed cones that look like berries, hence their name juniper berries. The cones are relished by many migrant and wintering birds. 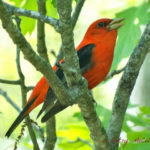 Today, our woodlands include maritime woodlands, such as holly, beech, oak, and red cedar; coastal oak-pine, oak-hickory, oak-beech, and oak-laurel forests of uplands, such as morainal slopes and ridges; red maple-tupelo and white cedar swamps of lowlands; oak-tulip tree forests of highlands, such as on morainal ridges of northern Long Island; and pitch pine-oak of outwash plains. The trees that dominate our deciduous woodlands are oaks and hickories; the chestnut was originally one of the dominant trees but these were killed by a devastating blight that hit in the early twentieth century. 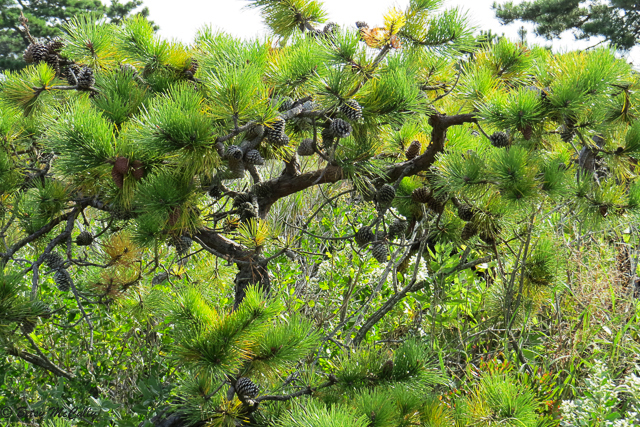 One of the most unique forests in the world is the Pine Barrens of central Long Island. This forest took root in the gravelly outwash of the post-glacial landscape, and over the millennia was maintained by periodic natural fires; in fact their cones depend on fire to open them and release their seeds. “Commercial Beginning of NY”, 1854, Carl Emil Doepler, artist; Lossing and Barritt, engravers. From the New York Public Library Digital Collections. Colonial farmers cut down trees with wasteful abandon, clear-cutting to create cropland and pasture. Domestic animals like cows and pigs trampled the understory and compacted the soil, which reduced the soil’s water-retaining capacity and prevented saplings from growing to maturity. 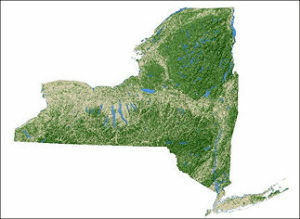 Between 1700 and 1900, 75% of New York State was deforested. 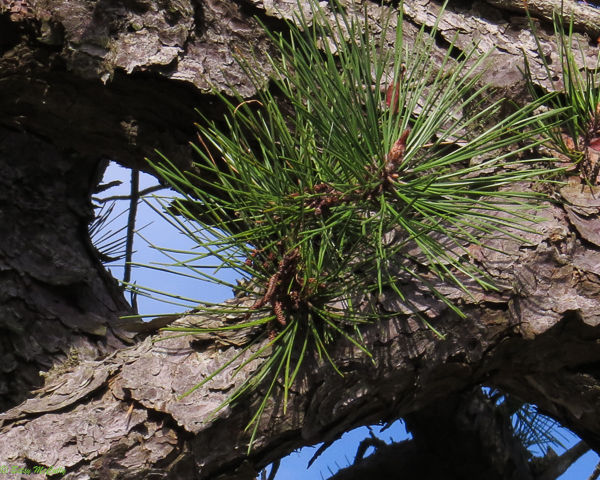 Pitch Pine bark and leaves. Leaves and cones can grow directly out of the bark. 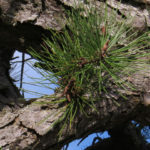 In the Pine Barrens, pitch pine trees were tapped to extract their valuable sap, which was processed into turpentine and pitch (hence their name). Tapping entailed making cuts a foot above the base of the tree, which eventually killed the tree. The Barrens were also clear-cut to provide both timber and fuel wood, as were the upland oak-hickory forests of Long Island. 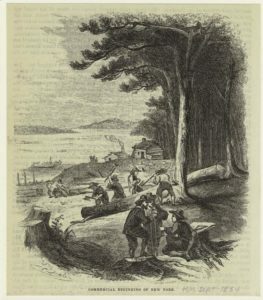 Reverend Nathaniel Prime, when touring Long Island to make a report on its churches in the 1840s, described passing through “5, 6, and even 7 miles of unbroken forest, without discerning a single human habitation, or the least trace of the hand of man except the stumps of felled trees.” Despite the clear-cutting, Prime found that Long Island still had more forested lands than he found in the Hudson Valley, where he had lived. 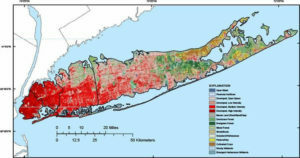 Long Island Land Use Map, 2006 [Public Domain]. The green area is the preserved Pine Barrens. Suburbanization, particularly since the 1960s, has continually eroded forest lands. 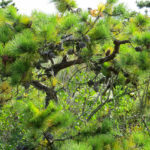 The Long Island Pine Barrens once encompassed 250,000 acres and is now reduced to a core protected area of around 52,000 acres, with a so-called “Compatible Growth Area” of about 48,00 acres where planned development is allowed. The Barrens would have been more severely eroded if not erased were it not for robust preservation efforts aimed at protecting the most vital source of fresh water on Long Island, the Magothy Aquifer that lies beneath. Added to the stresses of development, a new threat endangers the ancient barrens. 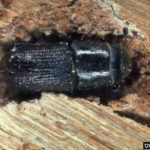 The Southern Pine Beetle has spread from the southern states to our region and is rapidly killing whole stands of pines, culling thousands of acres. They have spread here as our winters have become warmer. Once here, they are impossible to eradicate, so foresters can only try to control their spread. Our native forests and associated biodiversity will melt away, as can already be seen in many places, if we continue to ignore these threats…. Another threat to our forests is posed by white-tailed deer, whose populations have exploded in recent decades. Deer are radically changing the composition of our forests by consuming the understory. 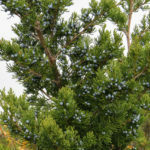 Blueberries and other berry-laden heaths, native wildflowers like orchids, and tree saplings have been nipped to the ground. 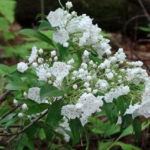 Woods have been taken over by catbrier and weeds are invading niches emptied of native wildflowers. Credit: Betsy McCully. 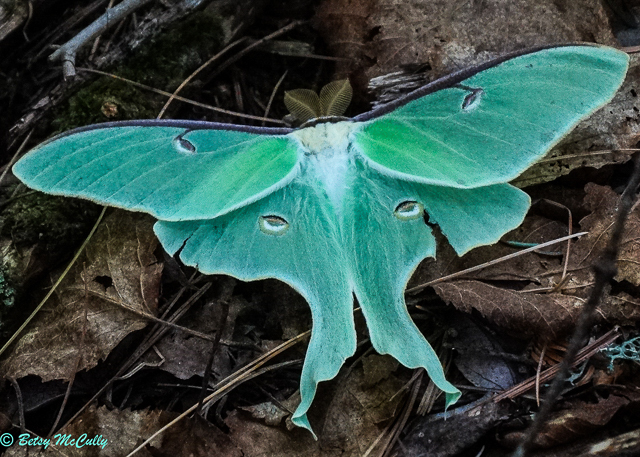 Luna Moth (Actias luna). Deciduous Hardwood Forests. Besides their impact on native woodland flora, deer are destroying the protective understory that provides cover and food for birds, butterflies and moths. 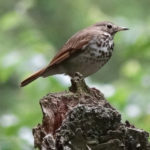 Both bird and insect populations that depend on healthy, diverse woodlands, are declining, and in woodlands severely denuded by deer, disappearing altogether. 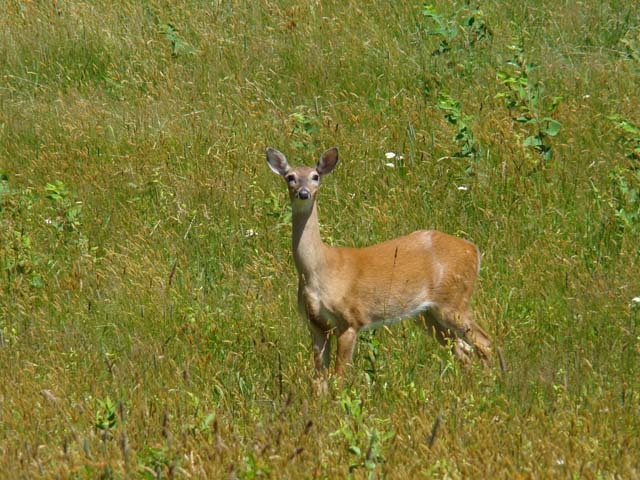 A 2005 report by the New Jersey Audubon Society stated that 14 woodland bird species and some 30 species of native wildflowers had disappeared from forest sanctuaries overrun by deer. 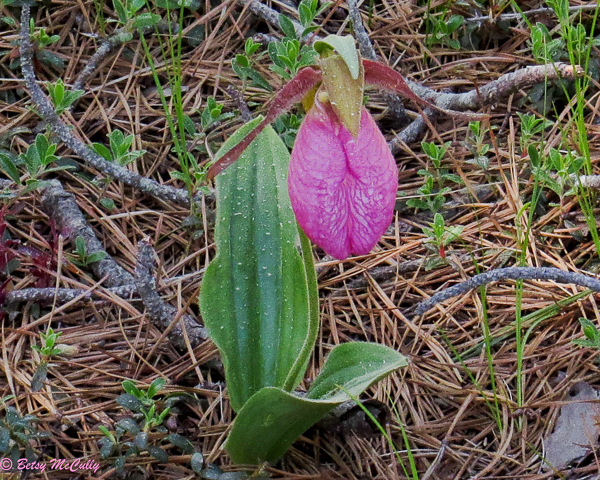 Pink Ladyslipper (Cypripedium acaule) growing beneath pitch pines in sandy soil. 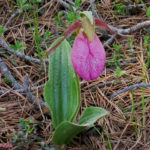 The woodland wildflowers that are disappearing include wood anemone, trillium, dwarf ginseng, trout lily, and orchids such as ladyslippers; birds include towhees, thrushes, black-and-white warblers, pine warblers, redstarts, and scarlet tanagers. 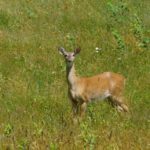 Loss of biodiversity, from trees and shrubs to birds and insects, will be the fate of forests if deer populations are not controlled and reduced. 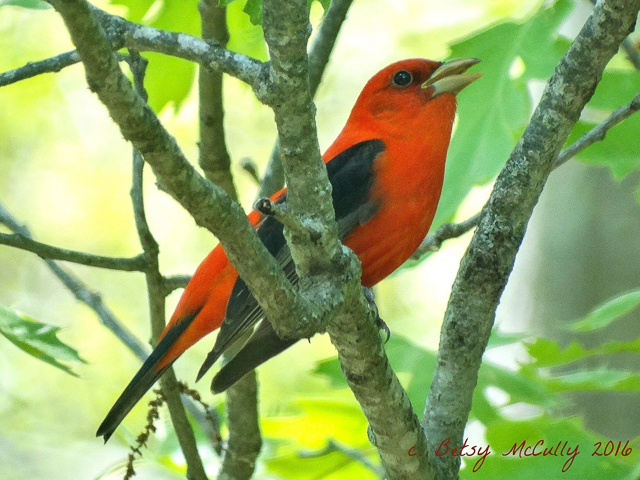 Scarlet Tanager (Piranga olivacea), male in spring. Forests. Viewed through glass. Breeder. Conservation ecologist Emile De Vito published an opinion piece in the New York Times in 2008 warning about the “catastrophic impact” of deer on tree regeneration and forest biodiversity in the New York metropolitan region: “Our native forests and associated biodiversity will melt away, as can already be seen in many places, if we continue to ignore these threats.” Where their numbers have been reduced, and understories allowed to grow back, trees and shrubs are regenerating and birds and wildflowers are returning. Credit: US Forest Service, 2018 [Public Domain]. As of the last survey of New York’s forest cover in 2017, the percentage of forest is 63%. 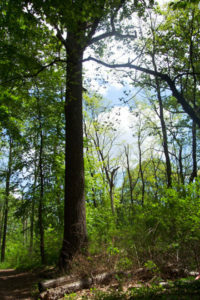 The decline of agriculture has helped the recovery of forests in New York State. By 1993, 62% was forest, 14% cropland, 4% pasture, and 20% urban/suburban, according to a survey by the U.S. Forest Service. Forest cover in New York State has remained fairly stable for four decades, as of the 2017 survey by the US Forest Service. Old-growth native forests in the New York region are precious few. None date to before the Revolution since British troops cut down all the trees for fuel. Remnant forests include the Midwood section of Prospect Park in Brooklyn, a section in the New York Botanical Gardens in the Bronx, a portion of Hunter’s Island in Pelham Bay Park, Inwood Hill Park in northern Manhattan, and Alley Pond Park and Forest Park in Queens. All have been degraded to one degree or another, and all have been overgrown by weedy and alien species. The Parks Department of New York City has undertaken a heroic effort to restore as much as possible the old woodlands on park lands. The effort entails uprooting and discouraging alien and weedy/invasive species, while encouraging the growth of native seedlings and saplings. Native tree restoration takes a long-term commitment. For example, hickories grow slowly and do not transplant well, so their re-establishment depends on the success of seedlings in taking root and thriving — a process that may take fifty years. 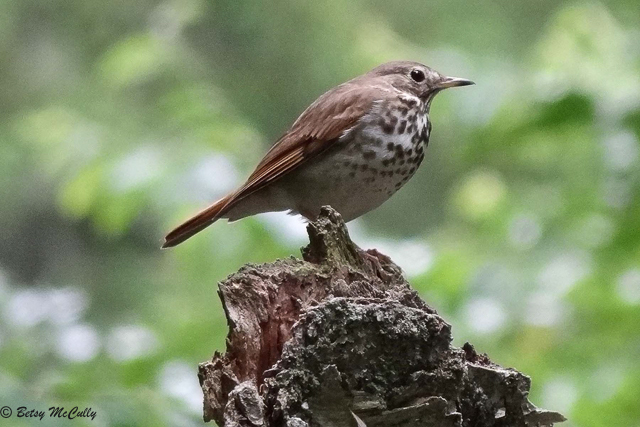 Hermit Thrush (Catharus guttatus). Forest. 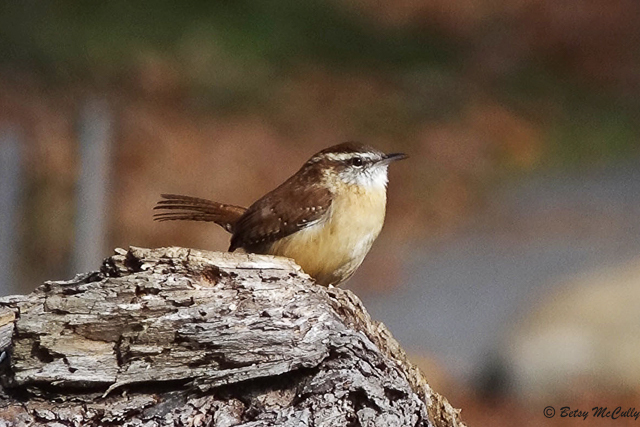 Breeder upstate; migrant. 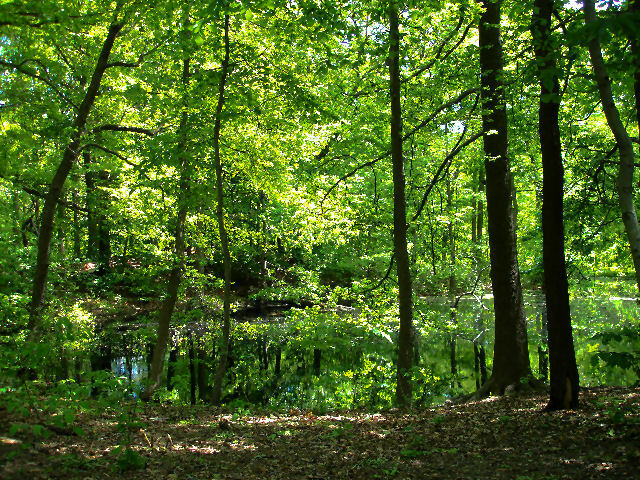 As of 2018, the NYC Parks Department has partnered with the Natural Areas Conservancy to revitalize the forests and wetlands of the five boroughs of New York City. A survey conducted by the NAC, working with the US Forest Service, reveals that NYC has a natural forest cover of 10,500 acres (half of the natural land areas in the city), of which more than 60% are in NYC parks. 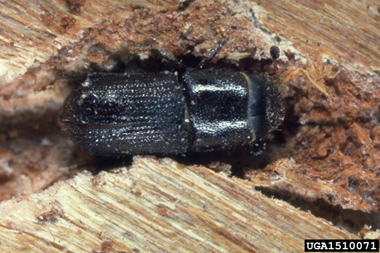 The forests include diverse mature and successional hardwood — oak-hickory and oak-tulip predominantly — and even fragments of ancient maritime coastal tree communities. A surprising percentage — 85% — is native forest comprised of 109 native tree species. What they also found was that these native stands are being degraded by invasive vines and other flora that inhibit the growth and regeneration of native trees. Their Forest Management Framework sets out a 25-year plan to restore and manage New York City’s urban forests. The website of New York City Parks has information on most of the parks mentioned here. I give you just a sampling. See also the section on parks in Leslie Day’s book, Field Guide to the Natural World of New York City (Johns Hopkins, 2011). In Prospect Park, Brooklyn’s only old-growth forest grows in a 20-acre section of Midwood, between Battle Pass and Binnenwater, where oaks, tulip trees, hickories, black birches, and sweet gums shade the woodland floor. The oldest tree in the park, a 220-year-old black oak, grows in the Ravine. During the Revolutionary War, most of the trees here were cut for firewood or cleared for crops to provision the British troops who bivouacked there. Native woodland restoration was implemented in Prospect Park in 1995, directed by Edward Toth, who headed the Parks’ land management office; their stated goal was to restore 250 acres of woodland. The Prospect Park Alliance has planted more than 20,000 trees. 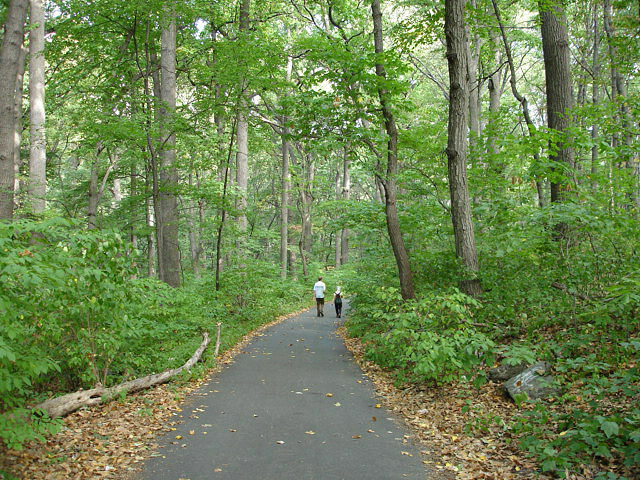 Inwood Hill Park has trails leading up through old-growth woodlands. Tulip trees dominate the woodland that grows on the schist ridge here (See Geology page). Pelham Bay Park in the Bronx offers a hike through native woodland beneath towering tulip trees and oaks. 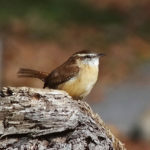 The Parks Department has planted a small woodland of native white pine, which has attracted wintering owls such as the short-eared and saw-whet. In Alley Pond Park in Queens stands a veteran Tulip tree known as the Alley Pond or Queens Giant, deemed by the park service the city’s tallest tree — but which stands neglected in an out-of-the-way corner of the park, protected by a chain-link fence. Its age is estimated to be around 350 years old, perhaps as old as 425 years, possibly the city’s oldest. As of 2002, its girth was measured at 19 feet, and its height at 134 feet; there is a blackened cleft at its base, with an opening large enough for a man to take shelter. This park contains a number of trails that take you through fine examples of oak-hickory, beech, and red maple woodlands. The Staten Island Greenbelt spans 2,800 acres and contains miles of trails that take you through a number of types of habitats. 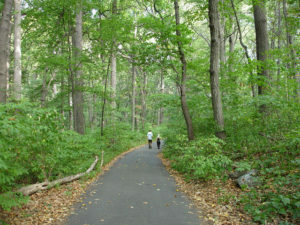 The trails of High Rock Park, in particular, take you through various types of woodlands. 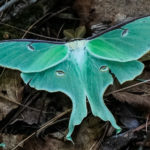 The old second-growth upland forest is predominantly oak-hickory, but you will also see tulip trees, sweet gum, and ash, and an unusual patch of rare native persimmon trees by Manor Road. As a bonus, a ridge of geologically rare serpentinite rock is exposed at the surface here. Barnard, Edward Sibley. New York City Trees: A Field Guide for the Metropolitan Area. NY: Columbia University Press, 2002.